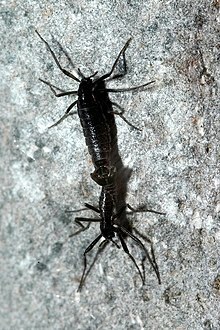 Belgica antarctica, the Antarctic midge, is a species of flightless midge, endemic to the continent of Antarctica. At 2–6 mm (0.079–0.24 in) long, it is the largest purely terrestrial animal native to the continent, as well as its only insect. It also has the smallest known insect genome as of 2014, with only 99 million base pairs of nucleotides (and about 13,500 genes). The flightlessness of B. antarctica may be an adaptation to prevent wind from blowing it into inhospitable areas. It can survive freezing, but despite air temperatures reaching as low as −40 °C, this insect will not be alive after temperature drops under −15 °C. This is less than other cold-adapted insects. The reason for this comparatively low freezing tolerance is due to thermal buffering: just burrowing at a depth of 1 cm, temperature is stable between 0 and −2 °C for 10 months out of 12, and it seldom goes lower than −7 °C all year round. Ice and snow cover also helps keeping the temperature stable. Freezing tolerance is enhanced by cold hardening. To adapt to the cold temperatures, B. antarctica accumulates trehalose, glucose, and erythritol. These compounds help the insect survive freezing by reducing the amount of ice that forms within the body. They also stabilize proteins and membranes, binding to them by means of hydrogen bonds. Heat shock proteins also help the tolerance to both high and low temperatures. B. antarctica not only tolerates, but also requires a freezing climate to survive: exposure of larvae to mild temperatures as +10 °C is enough to kill them within a week. Exposure to temperatures of +30 °C kills individuals in a few hours. It can, however, resist partial desiccation, surviving the loss of up to 70% of body water. B. antarctica spends most of its two-year lifecycle in four larval stages. Overwintering may occur in any instar. Terrestrial algae (particularly Prasiola crispa), moss, organic detritus, and microorganisms provide the food for the larval stage. The adults emerge in the spring and summer and live no more than 10 days; females mate in their first day of life and a few days later release eggs. Mating occurs in large groups of males, analogous to swarms of winged midges. ^ Jacobs, [J.-Ch.] (1900). "Diagnoses d'insectes recueillis par l'expédition antarctique Belge: Diptères". Annales de la Société entomologique de Belgique. 44: 106–107. ^ Usher, Michael B.; Edwards, Marion (1984). "A dipteran from south of the Antarctic Circle: Belgica antarctica (Chironomidae) with a description of its larva". Biological Journal of the Linnean Society. 23 (1): 19–31. doi:10.1111/j.1095-8312.1984.tb00803.x. ^ a b Luke Sandro & Juanita Constible. "Antarctic Bestiary — Terrestrial Animals". Laboratory for Ecophysiological Cryobiology, Miami University. Archived from the original on 23 December 2008. Retrieved December 9, 2008. ^ Kelley, Joanna L.; Peyton, Justin T.; Fiston-Lavier, Anna-Sophie; Teets, Nicholas M.; Yee, Muh-Ching; Johnston, J. Spencer; Bustamante, Carlos D.; Lee, Richard E.; Denlinger, David L. (2014). "Compact genome of the Antarctic midge is likely an adaptation to an extreme environment". Nature Communications. 5. doi:10.1038/ncomms5611. ISSN 2041-1723. PMC 4164542. PMID 25118180. ^ "Antarctic midge has smallest insect genome". BBC. 2014-08-12. Retrieved 2014-08-12. ^ a b c d Lee, R. E.; Elnitsky, M. A.; Rinehart, J. P.; Hayward, S. A.; Sandro, L. H.; Denlinger, D. L. (2006). "Rapid cold-hardening increases the freezing tolerance of the Antarctic midge Belgica antarctica". Journal of Experimental Biology. 209 (3): 399–406. doi:10.1242/jeb.02001. PMID 16424090. ^ a b c Robert Michaud, M.; Benoit, J. B.; Lopez-Martinez, G.; Elnitsky, M. A.; Lee, R. E.; Denlinger, D. L. (2008). "Metabolomics reveals unique and shared metabolic changes in response to heat shock, freezing and desiccation in the Antarctic midge, Belgica antarctica". Journal of Insect Physiology. 54 (4): 645–655. doi:10.1016/j.jinsphys.2008.01.003. PMID 18313070. Keilin, D. (1912). "Sur l'anatomie et le développement de Belgica antarctica Jacobs, Chironomide antarctique à ailes réduites". Comptes rendus hebdomadaires des séances de l'Académie des Sciences. 154. BHL page 7167537. Convey, Peter; Block, William (1996). "Antarctic Diptera: Ecology, physiology and distribution". European Journal of Entomology. 93: 1–13. Elnitsky, M. A.; Hayward, S. A. L.; Rinehart, J. P.; Denlinger, D. L.; Lee, R. E. (2008). "Cryoprotective dehydration and the resistance to inoculative freezing in the Antarctic midge, Belgica antarctica". Journal of Experimental Biology. 211 (4): 524–530. doi:10.1242/jeb.011874. Lopez-Martinez, Giancarlo; Benoit, Joshua B.; Rinehart, Joseph P.; Elnitsky, Michael A.; Lee, Richard E.; Denlinger, David L. (2009). "Dehydration, rehydration, and overhydration alter patterns of gene expression in the Antarctic midge, Belgica antarctica" (PDF). Journal of Comparative Physiology B. 179 (4): 481–491. doi:10.1007/s00360-008-0334-0. This page was last edited on 2 March 2019, at 23:03 (UTC).